A Nazi soldier knocks down a young boy entering the Warsaw Ghetto causing him to spill, from his coat, potatoes and other vegetables he had been carrying. The soldier kicks the boy but is interrupted by a man carrying a doctor’s satchel and a wrapped parcel. The man, looking as if he can’t believe what he is seeing, yells at the soldier, “Stop! Have you no shame beating a child?” The soldier is stunned into stillness and looks away (in shame? Or to look for further orders from a superior? It is hard to tell exactly). The boy makes his escape and runs away into the Ghetto. The man with the satchel and parcel turns abruptly and walks away quickly. This scene, in Polish director Andrzej Wajda’s film Korczak, hit me with the force of a bus when I saw it in 1990. The film is the story of Janusz Korczak (aka Henryk Goldszmit) a Polish-Jewish pediatrician and educator who ran an orphanage (with Stefania Wilczyńska) in Warsaw for 30 years. The Nazi’s, in 1940, forced Korczak to move his orphanage into the Warsaw Ghetto where, after two years, the 196 orphans along with Korczak and Stefania were deported to the Treblinka extermination camp. 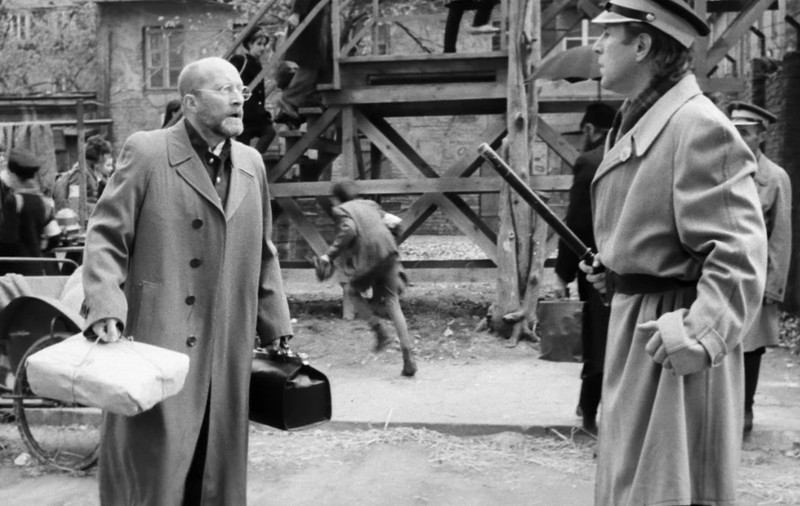 Despite repeated offers of rescue and sanctuary Korczak refused to leave the children choosing to share their doom. For most of my life I have wondered about this kind of confrontation – speaking truth to power, as the Quaker's say. The ethic and politics of this statement is one that has guided me my entire adult life. It is also something rooted in my own experience of voicelessness – something I learned through the work of Alice Miller and whose books I am avidly re-reading after a many years hiatus. Nor can I claim that I have “found” my voice. I am still searching (or constructing, if you prefer a building metaphor). My search has led me to French philosopher Michel Foucault’s final lectures in which he applied his genealogical method to the greek term parrhesia, variously translated as “free speech”, “to speak everything”, “to speak boldy” or, as was used in the title of the book of these lectures, “fearless speech.” Foucault’s work on this term’s diverse uses over several hundred years and several cultures is, as usual, brilliant if, tantalizingly, incomplete. But he shared enough to make the case that this term defined a particular relation between people and truth that changed over time, beginning, perhaps, in a context in which truth, speech and power corresponded in a naïve political manner and evolving (genealogically) to name the more complex inter-relation of truth, education, philosophy, power and speech and, of course, forming the roots of our contemporary notions of free speech and human rights. Suffice to say, by the time Foucault is done, we’ve traveled over half a millennium from Socrates, Plato and Euripides to Plutarch and Seneca, et al. There is one particular sense of parrhesia that hit me with the power of the revelation of finding a word that names something that you have experienced but for which, until that moment, you had no name. Patterns for which we lack names are like fish that flit away out of sight just before we catch them in our focus. Without a name it is hard to be certain if what we are noticing is, in fact, a pattern – or at least a meaningful one. (Nor do I want to imply that my choice of focus here represents any essential definition of parrhesia – the nature of Foucault’s work is precisely to show that it is a process – an on-going dialogue – not a thing set in stone). Nonetheless, this word now serves to allow me to see more clearly a pattern of resistant communication (i.e. resisting oppressive power) that I have witnessed, watched, heard and experienced. Understanding that a risk of harm is part of the process now makes clear to me many experiences i have had in which i have faced oppressive power and have either chosen to speak or not, according to my willingness to risk. Sometimes i have been too afraid (intimidated by someone i feared would get physically violent). Other times, simply foolish (standing at gunpoint in Honduras and explaining to some soldiers that shooting me would cause them no end of trouble). And, more rarely, considered and intentional (refusing to obey a boss's ridiculous request and being fired as a result). I know that my capacity to face power and see its oppressive dimensions has everything to do with what and how i learned to see as a child - something i continue to struggle with. Alice Miller's work on "emotional blindness" is, sadly (if also healingly), an accurate naming of what i suffered. But though afflicted with emotional blindness for my own sake i was, nonetheless (and perhaps as a compensatory strategy, of course), able to see the suffering of others. I educated this "seeing" and learned that popular education was the best praxis in the world for creating environments, relationships (including sharing resources) that enabled participants to seize the opportunity to resist oppression - including that which i inevitably represented despite my commitment to being in solidarity with the oppressed. In this work i have struggled to resist the fatal flaw of exceptionalism which, for me, is that conceit that, being special (i.e. having supposedly learned the lessons of privilege and oppression), the normal rules no longer apply. This is a caution to all activists who, abundant with the unearned privileges of a classist, racist, sexist world choose to work in alliance with people who are oppressed, but who must exercise a solidarity that includes a good deal of humility. What parrhesia does for me now is to clarify a dilemma in this work - how do i apply a necessary humility (as someone with a lot of privilege) in so-called anti-oppression work? On the one hand, this is what appeals to me in popular education - the creating of conditions within which just communication and encounter can happen. On the other hand, privilege and oppression are tricky matters and confronting and overcoming them is fraught with contradiction and risk. Part of this struggle is developing (if, at times, an act of recovering) and practicing new vocabulary. Parrhesia, a perhaps awkward ancient Greek word for our modern tongue, is a crucial piece of this vocabulary. "Fearless speech" is a good translation of a key aspect of parrhesia though the word encodes much more that is important to attend to. So, is parrhesia something that can be learned? Is it a skill or tool for which training can equip people to apply in appropriate contexts? I tend to think that such an approach would be quite futile. Rather, if parrhesia is about a relationship/encounter with power, then its performance is something that grows out of one's subjectivity (who you are, as it were. Which is also where it connects with Foucault's notions of the "care of the self".) Parrhesia is something that can only happen if we create ourselves as people who can see power clearly, who can look power in the eye and act with courage (i.e. the awareness that there is risk of harm but that, despite this risk, we must act anyway). Doesn't this make it something that is a measure of our humanity - where "humanity" means our interconnectedness with everything (i.e. the human and non-human world)? Not that i think everyone should go out there and look for a chance to practice parrhesia. But it is something that i think of for my own sake (how can i exercise parrhesia as a reclaiming of a voice that was taken from - or denied - me? ); as a parent, for my children's' sake (what must i do so that my children will be able to practice parrhesia when the need arises? ); as a teacher (who can facilitate spaces in which people can learn that about themselves that will allow them to practice parrhesia? ); as a citizen and activist (who can, with others, speak truth to power?). I am only scratching the surface of this term. But already i can see parrhesia everywhere: the example of Korczak with which i began this musing; Frances Hodgson Burnett's protagonist Sara Crewe confronting the oppressive headmistress of the school in which she is trapped; the somewhat more complicated example of George Clooney's character in Michael Clayton confronting a corrupt corporate executive; and, from last week, Medea Benjamin, co-founder of the peace group CodePink, confronting President Obama during his May 23rd, 2013 speech on counterterrorism. I don't adopt challenging terms easily. "Hegemony" is one that i believe worth using despite the common sense (mostly bad sense) that shuns highfalutin-sounding words. And now i also include "parrhesia" in my vocabulary.